Continuing personae: Long Tim (Hobbit Ftr3), Brother Maccus (Human Ftr3). After the dreadful encounter with ghouls last time, other new PCs need introduction. New PCs: Aslak Jam Saskin (Elf Ftr2/Wiz1), a peddler of holy water and haunted by the spirits of earlier dead dwarven wizards; Dusteg Bronzehide (Dwarf Thf3), a trap-searching expert. 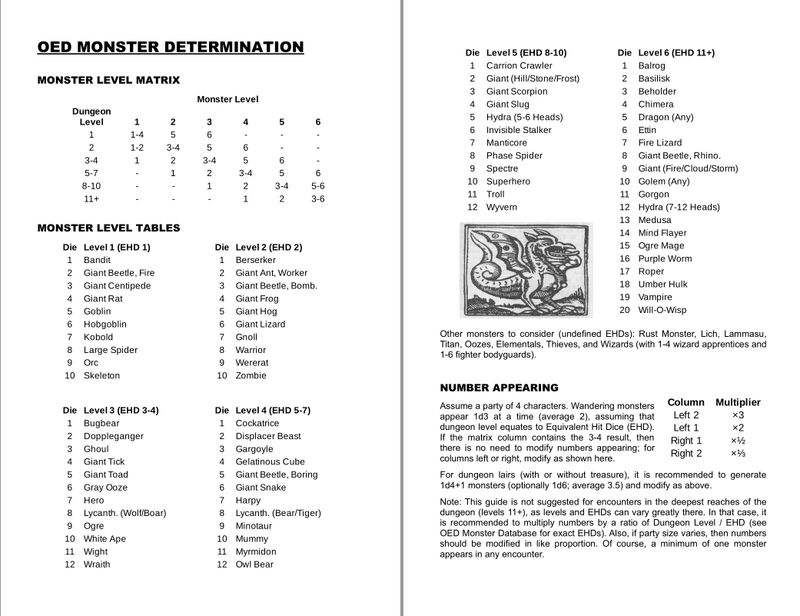 Interesting side note: The party Strength scores are now 15, 17, 17, and 18; this is assessed as "Darwin having written OD&D". Aslak JS makes use of the rule to "send[s] messengers to whatever place the desired character type would be found (elf-land, dwarf-land, etc.)" (Vol-1, p. 12), specifically elf-land, putting out a call to hire brave (but hopefully cheap and not-so-wise) elven adventurers. Three show up and two are hired after haggling on price and treasure shares (100 or 150 sp up front, and 1/8 each of all treasure); Tamar the Miller (Elf Ftr1/Wiz1; chain, war hammer) and Yulia the Ape (Elf Ftr1/Wiz1; chain, silver dagger, Str +1). Brother Maccus makes use of the "Rumors, Information, and Legends" rule (Vol-3, p. 23) on two evenings at the inn; pays out 90 sp and gets two tidbits: (1) the hexagonal chamber in the dungeon is to be feared; (2) there is a powerful necromancer in the woods not far to the north. After some debate and purchase of healing potions, the group decides to return to the monastery dungeon and seek the priceless fire opal once more. Into the pit; skirting the entry bone-mound, to the large empty ceremonial chamber. There, the secret door is closed and the makeshift steps gone. The group returns to the wood store in the dungeon, gets more logs, and recreates the climbing apparatus. Through the raised secret door into the crypt section. Look into the crypt-chambers to the immediate east and south; looking carefully for more lurking/hidden ghouls. Find hundreds of more bodies and skeletons in niches along all the walls; no exits and no obvious treasures, acting with utmost caution, the group backs out and searches elsewhere. Passing through the alcove guard post, the party is surprised that 8 animated skeletons destroyed earlier have been replaced; combat is once again engaged. This goes fairly well, with the bulked-up party chopping down skeletons left and right with swords, polearms, and halberds. It is over in less than a minute, a pile of shattered bones beneath their feet. Further south, off a smaller hallway to the west, a very old and locked, heavy oak door; silence behind it. Dusteg tries to pick the lock but it seems jammed. The three strongest members line up to kick it down together; this works, and the door snaps inward. Within: a single stone sarcophagus. Dusteg enters to search the walls. At this, the lid scrapes open and a hideous figure stands up; clearly dead, black leathery skin, hairless skull, old robe and gold medallion, fairly crackling with foul energy. A mummy? Dusteg runs and with Tamar slams the door shut; the creature within pulls on the door, almost beating their combined strength. The others back up 20 feet and pull out missile weapons. The two let go of the door and duck and run; the rest launch arrows and bolts which all shatter helplessly against the creature's hide. The thing launches at the plate-armored Maccus, rolling poorly; chalkboard-sound of nails gouging his shield. Everyone flees, running back up the long northern hallway. Maccus is slower than the rest, and the creature keeps pace; gets an attack at +2 and no shield; lashing at his ankles, again fails to connect. Rounding two corners, rolls are made to see if the creature follows (Vol-3, p. 2); these fail, the monster returns to its lair, and the party catches its breath. With few options, the party returns south; looks at the door which is shut but clearly no longer locked. Further south, small tunnels; to the east a dead end. To the west a small dead-end room with sarcophogus; this has merely a long-dead body and no treasure. A bit further south another likewise. Now time for a wandering monster check: this comes up "6" so something comes down the dead-end tunnel at the party; another roll indicates it is this same weapon-immune undead creature (which the DM just added to the encounter table after the PCs released it). Long Tim spots it as others are searching for secrets and everyone gasps. Aslak JS fires an arrow at the creature's gold medallion, but the shot goes wide. Tamar tries to hit it with her war hammer and this does nothing. Dusteg throws his silver dagger and connects; the creature recoils, silvery burning smoke wafting from the wound! Tim misses the medallion with his hobbit's two-handed sword. Maccus drops his sword with a clang, grabbing for the embedded silver dagger (success) and tries to hit with it (fails). Yulia also strikes with her silver dagger (the only other such weapon the party has), but also misses. The creature lashes out randomly; strikes Yulia for 4 points and drains her Wizard-class level permanently. Aslak casts protection from evil. Tamar casts magic missile and the creature takes full damage. Dusteg throws a normal dagger; hits it in the black eyeball, but it gets spit out with no effect. Tim severs the medallion, it falls off, but this also has no effect. Maccus connects with the silver dagger and the thing weakens. The undead misses its next attack; around the table again, mostly with no effect; and then Maccus finally gets position and finishes it off, twisting the dagger deeply in its dead-again chest, silver smoke billowing into the air. The group pick up its gold medallion and silver bracelets and give a healing potion to Yulia. Party decide to return to the village and sell this loot and recover. Split up 178 sp and 410 XP each (or 118 sp and 205 XP for the hirelings). Long Tim advances to 4th level; succeeds in mastering the ability to double-strike with a melee weapon. The next day, the party decide to explore the nearby northern woods for the necromancer of note, one "Akharis the Astonishing". It rains but the group take some rations and head off anyway. After a half-day's march, into the trackless woods; the encounter roll "6". A short distance ahead they are spotted by 3 giant snakes (20' long each) wrapped around an ancient, withered tree. The snakes slither down to attack, and most of the party uses various hiding powers to disappear in the bushes. Brother Maccus is left standing alone with no such special abilities. He looks (success) for a thick cluster of downed trees where only one snake can get through at a time, and stands at that point. The first giant snake slithers through and bites his shield; a miss. The whole group launch attacks, cutting and stabbing it multiple times. It bites Maccus' leg and starts coiling around him; before it can crush him it is finished off, but the next is upon them. Again Maccus is bit and wrapped; and again the thing is split up. The third is likewise attacked and defeated. Beyond the tree, the party spots a wide and deep ravine and on the mesa beyond, an a tall tower surrounded by trees. Having no obvious way (or time) to cross, they return to the village. Open questions: Can the party contact the necromancer, and will he/she/it be happy to see them? Does the party have any way to defeat the ghouls and find the fire opal in the dungeon -- if it exists at all? With Long Tim having reached maximum level as a Hobbit fighter, is there any way to cheat the rules, say, by training with a stronger or higher-level fighter? We shall see. Back in February, on the Facebook AD&D group, I asked a poll on the following question: "About how many pages of backstory is expected for a new AD&D 1st-level character in games you play?" As you can see, the most popular choice by far was "zero pages" (by default, what I would have answered, the thought never even naturally occurring to me) with about 60% of the votes cast; but "one page" was also popular, with about 20% of the votes -- even more popular than a "half page", with 13% of the votes. On the other hand, while almost no one picked options in the range of 5 or 10 pages, ten people picked either "20 pages" or "More" (2% of the total voters), and were likely to post a comment justifying this stance (and so triggering counter-comments from the no-backstory camp). 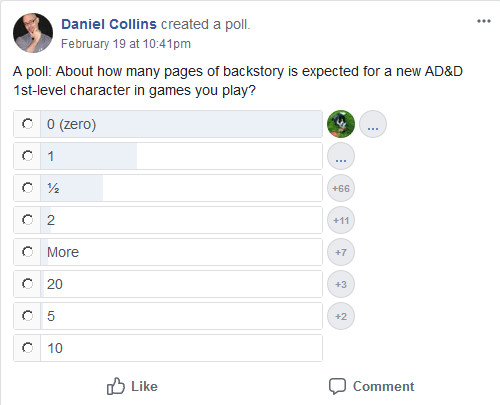 Disclosure: There is a possibility that a few people picked "More" (i.e., more than 20 pages expected) accidentally, as by default Facebook only shows the top 5 options in a poll until one clicks "More Options...", that is, the options for 5-10-20 pages would be initially not visible. In statistical practice, it is sometimes said that bimodal (or multi-modal) results like these indicate that one is measuring at least two disparate populations that perhaps should be separated apart in future analysis. The difference between "zero pages" and "twenty or more pages" of expected starting backstory is so startling that it does indeed seem like at least two different games are being played. My good friend B.J. Johnson, a.k.a. 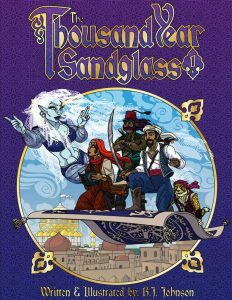 BigFella Games, has just released what may be his RPG magnum opus: the Thousand Year Sandglass, a fantastic Arabian-themed campaign that he's developed and run -- and which I've had the great pleasure in playing -- for about 10 years now. 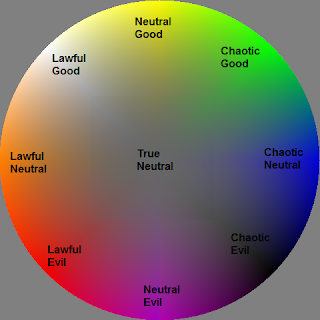 It has what I consider to be a uniquely and creative world, with never-before seen custom class, races, spells, magic items, monsters, etc. that have all popped out of B.J. 's genius skull. Plus top-notch art by the man himself. That probably doesn't do it justice, though. B.J. is the single most creative producer of RPG setting content that I personally know. Here's a little slice of what it's like gaming in the Thousand Year Sandglass or any of his other games: Start out and get a customized setting with custom pre-generated characters, backstories, companies, handouts, cards, counters, and custom miniatures. Play for 4 hours and every encounter is fresh and novel, and has B.J. rolling out (again) custom landscape, buildings, miniatures, music etc. -- every one hand-crafted just for the game in question. Then at the end sit back for some extra hours as he shows off the other 70% of the encounters, battlemaps, miniatures, charts, sub-systems, etc., etc. that we never encountered. It's jaw-dropping and inspiring and truly humbling. So some of us have been encouraging him for a while to pack up these ideas and make them public -- finally, you can take a look yourself and join in our amazement! 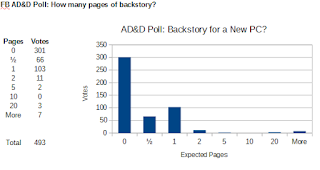 After presenting the campaign setting, it even has no fewer than 8 adventures at the back to use in your games. 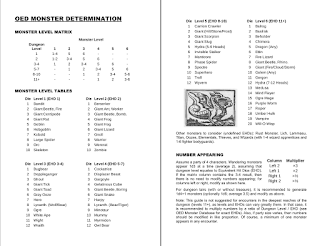 Officially uses Labyrinth Lord but (of course) easily compatible with any classic D&D system. It gets my highest recommendation: Check out Thousand Year Sandglass on DriveThruRPG. Personae: Long Tim (Hobbit Ftr3), Tahj Birdfoot (Elf Ftr2/Wiz2), Brother Maccus (Human Fighter 3), Penrod Pulaski (Human Thf3), Banjo Saskin (Dwarf Wiz 3). A month and a half since the last adventure, all are healed fully. Upkeep is 75 sp per person; restocked on healing potions. One complication: While Banjo recently achieved 3rd level through a cunning stratagem, which expands his mind to possibly memorize a 2nd-level spell, he has none such in his book. So he satisfies himself with memorizing 3 1st-level spells, and the group departs for the ruined monastery on a rainy morning. Traveling through passages previously explored. Looking down one passage, known to be trapped with hideous undead in cells, sees a glowing light -- reappearing even after the fake gem was removed before. Entering the lower storage chamber, Penrod hears a creaking noise: former bugbear hideout active again? Group proceed to the ruined wine cellar, formerly with a swarm of stirges that caused several deaths, last seen in flames. Entering wine cellar, smoky and acrid, a few partly-burnt stirges angrily take the air, but are quickly cut down with slings, thrown daggers, and swords. Enter a small nearby room, seemingly undamaged by nearby monsters. Pick up several bottles of aged, fine whiskey (value 2,000 sp total). Maccus open a door and several sacks of grain come toppling towards him. Passing through (and after some mapping confusion), realize they're back in the goblin storeroom, the door hitherto hidden by stacked foodstuffs. Explore a northern hallway that turns out to exit via a secret door back adjacent to the entry chamber. Having exhausted any obvious exits, the group decide to exterminate the two wood-store chambers full of giant fire beetles. Assemble at the first, Banjo throws a spike in to disturb them, and a half-a-dozen creatures run out. With the heavily-armored Tim and Maccus in front of the passage, and others launching missile weapons, they are defeated. Banjo cuts out a glowing gland and replaces his lantern with that item. The second chamber is attacked likewise; this time, Tahj casts sleep and all the strange creatures curl up in balls and get eliminated. Maccus pulls down most of the rotten wood pile; the group find and ancient heavy leather-bound sketchbook. Among the schematic notes is an apparent wooden stage construction. There is discussion and then an "Aha!" moment. Group returns to the large dead-end chamber off the entrance. Taking split cord wood with them, they affix the logs into the holes in the walls for a makeshift step-ladder. Tahj and Penrod climb and search for a secret door higher up the wall. Success! A hidden button pens a panel, and the group clamber into the dry, upper tunnel. Travel south; enter into a wide 20' corridor with a double row of horizontal niches on each wall; the niches are filled with ancient rotting wood coffins, bones, skulls, mixed-up bits of human remains. Maccus starts bashing skulls and chests in, but the job seems endless. Travel west and south. Here, a side-room with eight skeletons posted on the walls; the skeleton animate, stepping forward with rusty swords. The fighters protect the more vulnerable members. Tahj casts a magic missile and blasts one to splinters. Daggers get thrown in eye-sockets, ripping the skulls off. Maccus finishes off the last one with a mighty sword-blow. A small tunnel northwest, north, then a side branch is explored for secret doors. This disturbs a swarm of 10 giant rats that come pouring out of the wall, biting legs and feet. The party runs back from where they came. Once the rats have clearly settled back in their nests, the group returns north. Finds a half-octagonal chamber with a large stone sarcophagus and 5 painted panels on the walls; various scenes of a traveling monk, monastery, reception of gifts, training with arms, slavery of peasants. Maccus pushes the lid off the sarcophagus and a giant constrictor snakes slithers out? Tries to bite Maccus, who fends it off with a shield. Banjo casts sleep, but the creature is too large to be affected by it. This catches the monster's attention and it bites Banjo, casting horrible snaky loops around him and constricting. All of the party desperately attacks the thing, slashing and cutting. Banjo gets low on hit points and the party has only a few seconds to save him before more crushing occurs. Maccus gets a last hit in; is it enough damage? No, the snake has exactly 1 hp left, and it uses its dying breath to crush the life out of poor Banjo. Penrod finishes off the filthy thing. The group returns from the apparent dead-end chamber, traveling south and then a wide hallway southeast. They are joined by another dwarven wizard from the same college: Bill of RA. Step into a chamber with more coffins and bodies in the walls; consider exits east and northeast. As they pass through, they are horribly surprised by a half-dozen ghouls, disguised as corpses, stepping silently out of the niches. Ghouls are known to spread a horrible paralyzing fever with their bite, turning a victim into another ghoul. One is behind them, cutting off the exit. Surprise round: Every party member is attacked by a ghoul. First target: Bill, who takes a natural 20 for a critical: The nearby ghoul grabs and bites into his skull, instantly killing him. Next: Penrod takes a hit, misses his save, and is paralyzed; the fever racks his body, gnashing teeth, helpless. Tim and Maccus avoid attacks. Tahj takes a hit, but is immune as an elf. Initiative follows: This the party wins. Tim spins and attacks with his hobbit's two-handed sword, cuts the ghoul to the rear neatly in half at the waist, its diseased innards spilling out all over the floor. Tahj takes the opportunity and runs from the room at full speed. Maccus powerfully pushes the remaining party members back into the passage, blocking the entrance with his shield. Only two ghouls can attack, and they need a natural 17 to hit. The rolls: 4 and 17. Maccus misses his save and is paralyzed. Only Tim remains, facing 5 ghouls. Tim has a ghastly choice; he can only carry one of the armored, larger humans away. He grabs Maccus and fireman-carries him off. Burdened, he either has to remain visible in the main hall or take a small side tunnel that hasn't been explored yet. He takes this to get out of sight. Unfortunately: It's a dead end, and the ghouls have the chance to bottle him up and finish off almost the whole party. Rules say that semi-intelligent creatures are 50% likely to be distracted by food, e.g., Bill and Penrod. Tim's player calls the dice "high". A d6 is rolled and the result: "6". So amidst the horrible rending sounds, Tim slips back out with Maccus, rejoins Tahj, and escapes the horrible place. Back at the village with only 3 survivors. Aged whiskey is sold. Each gets 666 sp and 1633 XP. Tahj advances to a 3rd-level fighter. Have we seen the last of the ill-fated members of the Dwarven College of Magic? We'll see. In comments to the last post, G.B. 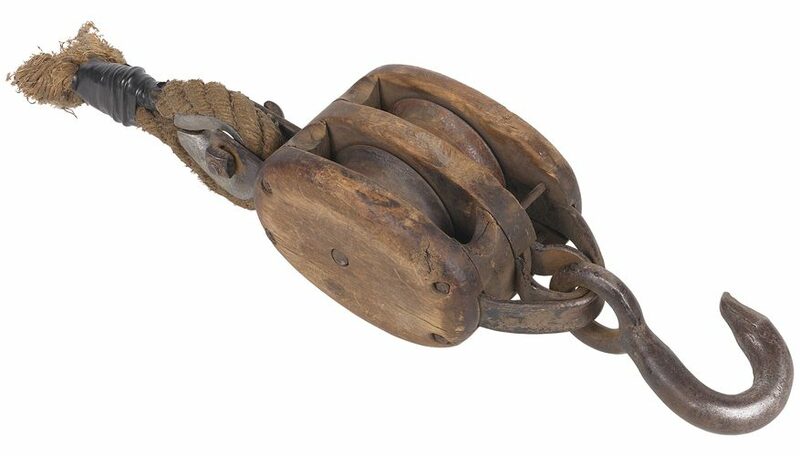 Veras pointed to a nice web page on the economics of medieval rigging (MIT History Dept. ), and asked how much rope costs in my games. The short answer to that is that by default, I just use the stock Original D&D equipment list, read as silver pieces, so: 1 sp for 50'. For things either not on the list or clearly broken, then I look to outside source like the Medieval Price List (or whatever) and convert with the interpretation that 1 sp = 1 groat (that is: 1 shilling = 3 sp). This usually comes out closer to the D&D equipment list than you'd normally expect. Let's use G.B. Veras' cited MIT page as an exercise. The page in question says that over three years or, 4,327.3 kg (9540 lbs) of rope were sold out of Bridgeport at a cost of 134 pounds sterling (including 20% transport cost). 1200 ft/45 pounds is proportional to about 50 feet/2 pounds. 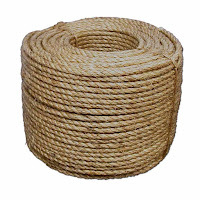 Dividing this into the Bridgeport figure, we get 9540/2 = 4770 lengths of 50' rope. Dividing that into the price figure we get 134/4770 = 0.028 pound sterling. Then 0.028 × 20 = 0.56 shillings. Then 0.56 × 3 = 1.69 silver pieces. And if we back out the stated shipping cost, then we get 1.69 × 0.8 = 1.35 sp. So once again I'd say that's "close enough" to the book D&D prices, if we read them in terms of silver pieces/groat coinage (namely: 1 in this example). 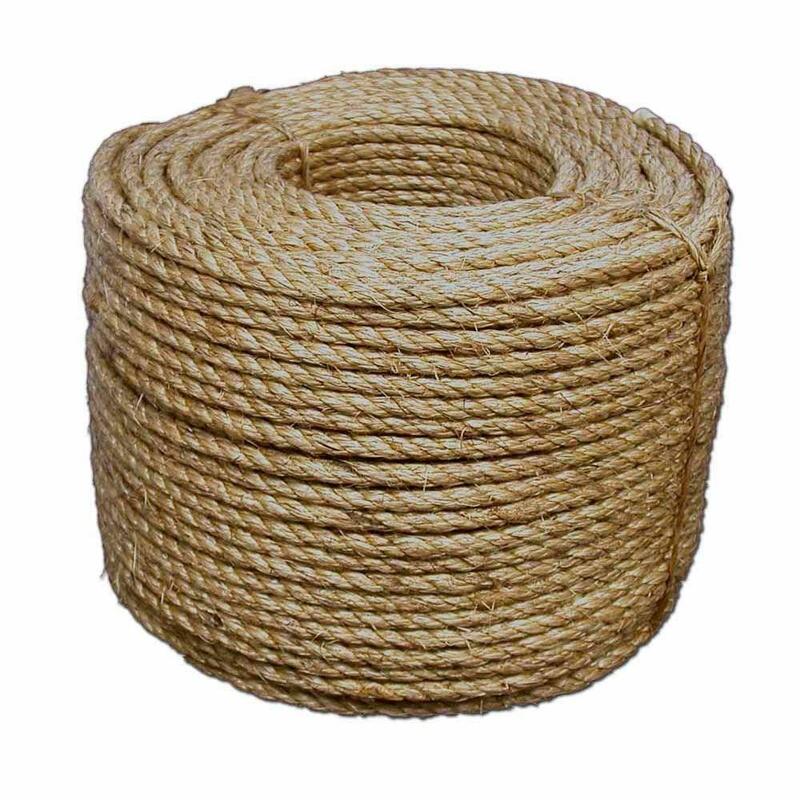 A side issue is that the weight of the example 50' rope is only 2 pounds, which is less than half the weight currently specified in the OED rules supplement (specifically: 1/3 stone, that is, 14 × 1/3 = 4.6 pounds; whereas the AD&D DMG specifies 75 coins = 7.5 pounds). Presumably that's okay in OED if we assume the number is inflated for overall bulk/awkwardness in carrying it. Thanks to G.B. Veras for the data and the interesting exercise! Only on the Hotspot: A post about how pulleys work. I've made at least one really bad call in-game about them previously. So here's my homework-atonement. Pulleys have been in use since antiquity. Archimedes in the 3rd century BC studied it as one of the three most basic machines (lever, pulley, screw). Heron of Alexandria in the 1st century AD included it in his list of five basic machines (lever, windlass, pulley, wedge, screw), and described crane mechanisms using several pulleys. Renaissance scientists identified it as one of the six "simple machines". Specifically in the medieval period, pulleys were used to hoist materials when building castles. Later drawbridge mechanisms used pulleys. They are part of the mechanism for a trebuchet. Some crossbows incorporated pulleys for cocking as early as the 13th or 14th century. On sailing ships they are referred to as block and tackle (although I couldn't confirm the earliest date of such use). How much should one cost? Looking at the Medieval Price List, we can compare them to a vise, which seems like a machine of comparable sophistication (a large screw, basically). In the early 16th century this is documented at 13s 4d, or about 40 silver pieces in our silver-standard conversion of 1s = 3 sp groats. (In D&D book inflationary money, that might be 40 gp.) Note that if used for climbing or hauling, PCs would still need to find a solid structure to hang one on. 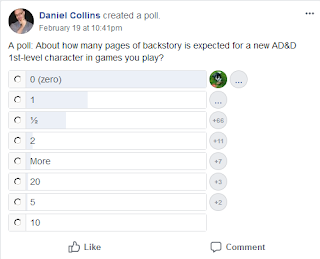 Over at the OD&D Discussion Proboard, user Piper started a poll on people's preferred AC/combat mechanic, specifically: OD&D RAW Tables, Swords & Wizardry Ascending AC Conversions, or OED Target 20. I'm intrigued by the results so far. Thanks to Piper for thinking to survey that!